My partners frequently poke fun at me (ok there is a long line of folks doing this…), specifically for thinking too deeply about a topic, and expressing an idea with too much detail. I would like to get real simple here. 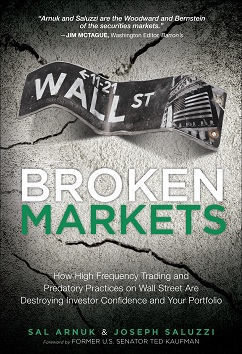 High Frequency Trading is proprietary computer trading with the goal of collecting rebates, and/or detecting real order flow (ie. institutional flow) and frontrunning it and making pennies. First, whether the market is trading at a 16 P/E, or a 22 P/E, or a 30P/E… this is decided by 30% of the volume in the market. 70% of the volume is noise. Less than 30% of the players are doing the thinking. In the “olden days” there were many different types of market participants (Value players, MOMOGOGO momentum players, Chartists, GARP players, and so on). None of them were 70% of the volume. This made for an efficient market. This made for a market where we felt strongly that the pricing in the market reflected actual asset values. This recent HFT 70% market share makes me very nervous. I hope it does you, as well. Second, the HFT players are courted by the Exchanges, ATS’s, ECN’s and Dark Pools. They are given whatever they want, as these for-profit destinations all want their volume. They see institutional orders (FLASH) before the public does. Would they (HFT) have grown to this level if the exchanges and trading destinations were not for profit? Is there a national interest in insuring that (1) our exchanges are the fairest, with equal access for all to the best prices, and not just those with their servers located inside the actual exchange, (2) our exchanges are transparent, and (3) that the system is working as it should, where asset values are reflected in prices? Was it the beginning of the end when all our exchanges went to a for-profit model?